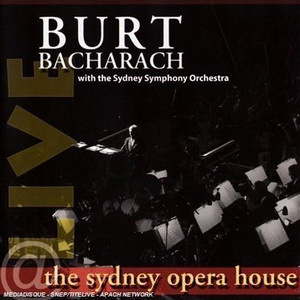 "Live At The Sydney Opera House"
Until they’re all heard one after another on a single collection, it’s hard to realize just how many pop standards Burt Bacharach has penned. This live recording, featuring the composer and his band accompanied by the Sydney Symphony Orchestra, showcases almost all of his most famous melodies, providing a reasonably complete but surprisingly superficial overview of the songwriter’s oeuvre. Although the liner notes cite 32 tracks, that number is deceptive, as more than half the cuts are condensed into three lengthy medleys. Classics like "Walk On By," "Do You Know The Way To San Jose," and "What’s New Pussycat" are presented in varying degrees of completeness, voiced by talented yet otherwise unfamiliar singers. Performances of such crowd-pleasers as "Raindrops Keep Fallin' On My Head" are infectious, but in all honesty this is the type of disc that, after one or two spins, will attract more dust than delight.